PETALING JAYA: Sunway REIT Management Sdn Bhd, the manager of Sunway Real Estate Investment Trust (REIT), will refurbish Sunway Putra Place to rejuvenate and reposition the property as an exciting tourism and shopping destination. This follows the Federal Court's decision on Feb 20 to dismiss the application by the property's previous owner, Metroplex Holdings Sdn Bhd, for leave to appeal the High Court's and Court of Appeal's decision to declare OSK Trustees Bhd as the legal owner of Putra Place. Putra Place was acquired by OSK Trustees, on behalf of Sunway REIT, in a public auction in March 2011 for RM513.94mil. 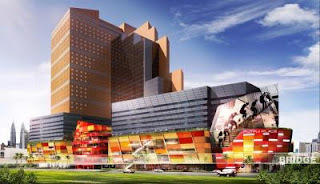 The property, comprising Legend Hotel, an office tower and a mall known as The Mall, has been renamed Sunway Putra Place. Sunway REIT Management chief executive officer Datuk Jeffrey Ng said the preliminary capital expenditure for the refurbishment of the mall was estimated at RM200mil, while that for the hotel and office tower would be on a need basis. “The refurbishment of the mall is to expand the total gross floor area from 860,000 sq ft to 952,000 sq ft.
“Meanwhile, the net lettable area will be increased from 505,448 sq ft to about 620,000 sq ft,” he told StarBiz. The work will take 15 to 18 months and will provide a projected return on investment of 12.5% to 15.0%. Ng said the creation of new net lettable area and better retail layout planning “will translate into substantial increase in rental income in the future”. “Sunway REIT is optimistic about the future prospects of the 3-in-1 mixed-used property of Sunway Putra Place and expects substantial capital appreciation post-refurbishment. “Our new tenancy mix will draw new and larger crowds to Sunway Putra Mall, and the businesses of Sunway Putra Hotel and Sunway Putra Tower will benefit synergistically from the transformation of the new shopping mall,” Ng added. He said tenants at Sunway Putra Mall would appreciate the modern ambiance with improved retail layout and circulation in the shopping mall. A distinctive retail zoning will be one of the main features of the mall, with new interesting concepts such as food and beverage, alfresco and entertainment concepts to create vibrancy. He said the Asian Avenue would be a unique retail theme with food and entertainment components as well as an addition of eight cinema screens. The refurbishment plan will also include improvement in traffic circulation within the proximity of Sunway Putra Place. Studies are also underway to improve vehicular traffic on both ingress and egress points of the mall, direct linkage to the LRT station, and covered pedestrian walkways to the KTM Komuter station and Putra bus terminal. PETALING JAYA: TA Global Bhd and Birkbeck Trust planned to jointly develop a high-rise mixed-use project consisting of hotel and residences in Vancouver, British Columbia, Canada. The project is to be carried out under a partnership arrangement with an initial contribution of C$110mil (RM339mil) by each party. The proposed joint development has a gross development value of C$496.4mil (RM1.53bil) which consists of a eight-level underground parkade and a 64-storey building comprising a four-level podium and a 60-storey point block which would house 61 guest rooms with supporting amenities. and 249 units of residences. Construction will start in the third quarter of 2012 and will likely be completed by mid 2016. The total development cost of the project is C$359.8mil (RM1.11bil), with land cost alone taking up C$110mil. The land is acquired from the Birkbeck Trust by assuming C$85mil (RM262.1mil) of its existing debt liabilities. Therefore, the liabilities to be assumed by TA Global in this partnership will be 50% of the debt liabilities, amounting to C$42.5mil. The parties are expected to make profits of C$136.6mil (RM421.5mil), not taking into account the debt liabilities of C$85mil. The project has a total gross development area of 730,504 sq ft and a total net saleable area of 492,702 sq ft.
KUALA LUMPUR: Meda Inc Bhd will buy a 103.69 hectares of land in Sg Siput, Perak, from Majuperak Holdings Bhd for RM13 million. The acquisition is for mixed development comprising commercial and residential properties.